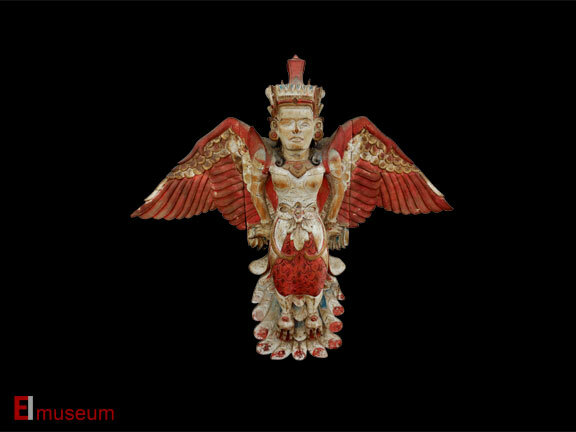 Initially, we described this piece as a Kinnari which is a celestial half-woman, half-bird statue found throughout SE Asia and India. Its male counterpart is referred to as a Kinnara. However, we have received comments from both Bruce Carpenter and Garrett Solyom - two widely recognized scholars of Balinese culture - that this piece actually originates from Bali and is called Kumara. Kumara's are used to hang nearby a newborn's bed and protect the child from evil spirits. Since this piece has a striking similarity to a Kinnari, there may be a connection between the two.